How to correct coma ? Off-axis light hitting a non-axially symmetric mirror will experience some aberrations in the form of coma (stars at edge of the field look like comets, showing an open tail converging toward the optical center) and astigmatism (light from differents planes does not focus at the same focal point. Image is distorted, stars become cruxiforms). Both phenomena can be more noticeable at short f/ratios (in "fast" telescopes) at f/6 and below. For a large scope and away from the optical axis, astigmatism can be more pronounced than coma. In the best optics, astigmatism can be throw out at a few degrees from the optical center. 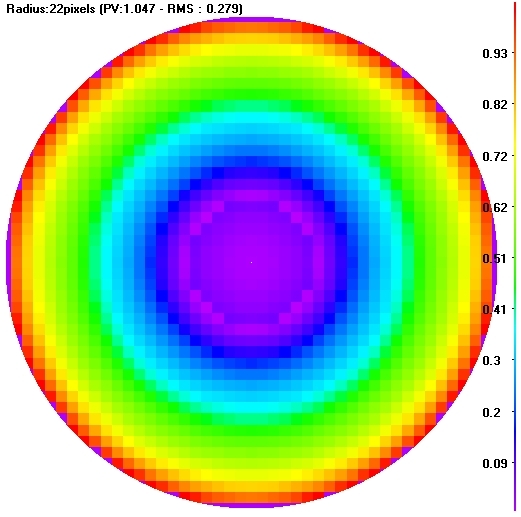 The theoretical image of a star as seen in a refractor. At right coma of 0.6l and astigmatism of 0.3l. Below, slice of rays paths without and with a coma of 0.6l. Spherical mirrors have coma unless the field stop is at the center of curvature, like in Schmidt Camera (around f/2.5). It is good to know that a paraboloid mirror of long f/ratio (f/10 for example) and an equivalent long focal spherical mirror will have equivalent coma. Therefore an additional optical element in the form of a corrector lens must be used to manage this aberration. Newtonians have coma first because they use a paraboloidal primary mirror and far behind because they only use one optical element. Their primary mirror is not easy to correct and the secondary mirror usually does not contribute to the aberration. The Tele Vue Paracorr reduces coma but only if the Newtonian is properly collimated (if the optical axis does pass through the center of the Paracorr). 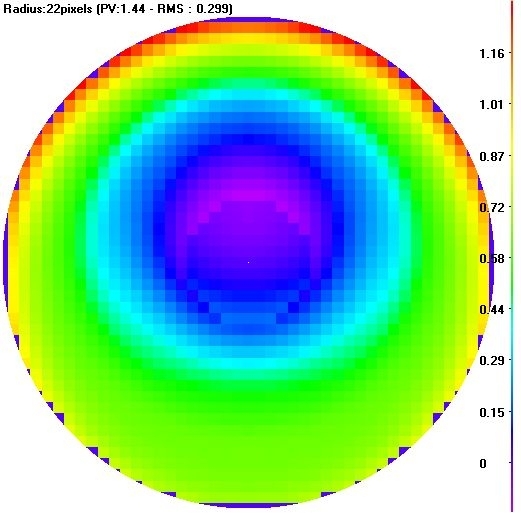 But in fast telescopes the coma reduction at the edge of field of view is paid by some degradation of the spot size in the center we can easily show using a ray tracing program. 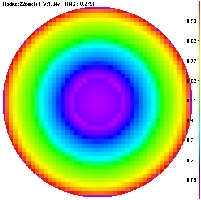 Using a Paracorr, one can estimated a loss of 0.1 magnitude in the center of field and a gain of 0.5 magnitudes at the edge of field in a f/4.5. 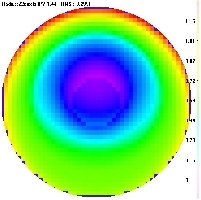 So, the outer field is improved at the expense of the diffraction limited field sharpness. Cassegrain and its variants (Ritchey-Chrétien, Dall-Kirkham...) have a longer effective f/ratios which reduces drastically the coma and not necessary because they use two optical elements. Their field curvature does tend to be greater than that of Newtonian of equivalent focal length. The best two-element Cassegrain design which handles coma well is the Ritchey-Chrétien concept. This system uses a slightly hyperbolic concave primary mirror and a strongly hyperbolic secondary mirror which together reduce significantly coma, although they introduce their own set of aberrations (astigmatism, field curvature, etc). The Dall-Kirkham has even more coma than the classical Cassegrain does. On the contrary Ritchey-Chrétien are often used in astrographs because they can be built in large apertures and have the least coma over wide field of the two-mirror designs. A left without aberration, at right with a coma of 0.6l simulated in a 200mm refractor. Clic on images to enlarge. Catadioptric designs (Maksutov-Cassegrain or Schmidt-Cassegrain) add a frontal lens, a refractive element which allow designers to have a third degree of freedom to further reduce various aberrations. However, the frontal corrective lens tends to limit these designs to smaller apertures, up to around 16" or 400 mm. Usually these designs are well corrected for coma but the Maksutov-Cassegrain (Intes, etc) reduces it better than an equivalent Schmidt-Cassegrain (Celestron, Meade) with a better image sharpness too. In order to reduce correctly coma, the corrector plate used in Schmidt-Cassegrain has to be designed to very close tolerances, at around 1% of the Radii. 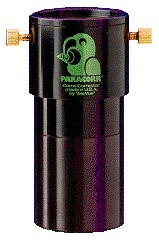 Some manufacturers use the SCT secondary mirror to correct spherical aberration too. But at short f/ratios all SCT present some coma. You still end up having to use another set of optical elements in the form of a field flattener to improve the performance. This accessory for SCT is well-known, this is the f/6.3 Reducer/Corrector that, in addition to "speeding up" your SCT will flatten the field curvature, throwing out most of the coma. The aspect of a planet depends on your focusing of course, but also on residual aberrations. 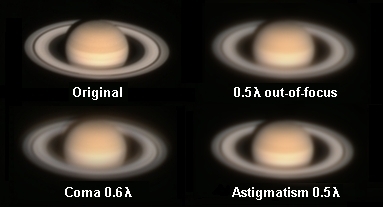 These simulations of Saturn as seen in a 12" scope show that an out-of-focus over 0.5l is equivalent to a coma of 0.6l or higher or an astigmatism of 0.5l. Even if your scope is focused correctly, and without take into account the weather factor, these aberrations give to your subject a blurry aspect. All images generated with Aberrator. In short, no optical system is perfect. Few manufacturer however will tell you what are limitations of their designs. Many low to medium ranges SCT for example have a out-of-tolerance corrector plate. That means that their scopes will not correct any coma because the optical test will never measure it ! The scope of such brands are placed in the foreground and presented as "diffraction limited" but in the field their coma is much higher that the numbers indicated by the ray tracing software. The solution is to ask for the numbers for the corrector plate itself, the only element that has to be properly corrected instead of searching some data about a residual coma you have further to correct using an add-on corrective lens.